81st Seattle King County First Citizen has had on our community. Presented by Seattle King County REALTORS®, John L. Scott Real Estate and Windermere Real Estate. In 1939, years of economic hardship during the Great Depression had taken a toll on the spirit and morale of the people of Seattle. In response, REALTORS® sought to boost public sentiment and brighten our outlook by drawing attention to the positive community and civic work taking place throughout the region. To that end, REALTORS® commissioned Seattle artist Dudley Pratt to sculpt an expression of the great work that can be accomplished by those who support the needs of the people, a work emblematic of “those who seek first to serve our citizens.” Each year since, the Seattle King County REALTORS® have presented the First Citizen Award as an expression of gratitude to those who devote themselves to the well-being and prosperity of our community. First Citizen recipients hail from humanitarian organizations, charitable and educational institutions, art groups, environmental causes and other civic endeavors. 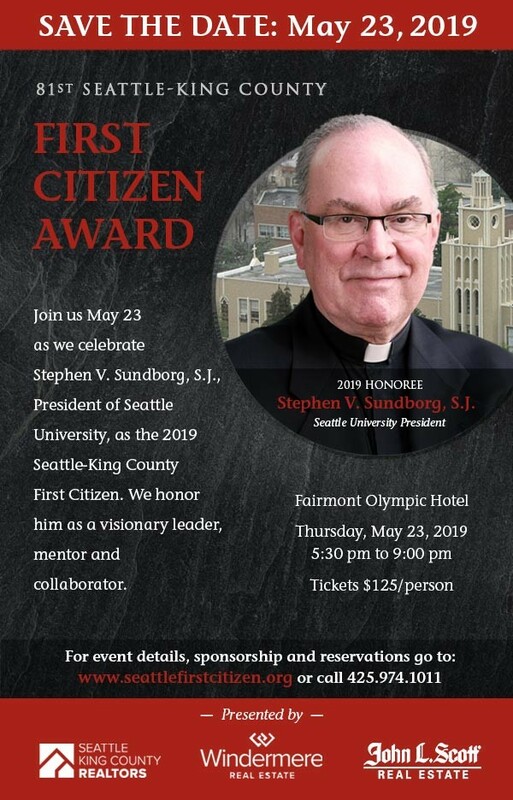 The 80th Annual Seattle First Citizen Award Banquet honoring The Pigott Family, founders of PACCAR, was held at the Fairmont Olympic Hotel on May 23, 2018. The 79th Annual Seattle First Citizen Award luncheon honoring Bill & Jill Ruckelshaus was held at the Sand Point Country Club on May 9, 2017. The 78th Annual Seattle First Citizen Award Banquet honoring Phyllis Campbell was held at the Fairmont Olympic Hotel on May 25, 2016.